Okay. I have been asked many times what verifications are there that a particular fermentation culture is safe, “clean” or “pure”? Whether its yogurt, kefir, sourdough, kombucha, buttermilk, cheese, or koji; the question remains. For the most part, natural fermentations are quite rigorous and the true culture organisms predominate. If foodborne illness organisms get into the culture, it is likely they will not survive due to microbial competition from the culture. However, studies of pathogens in fermentation cultures are few and far between. About a decade ago I sent emails to about a dozen small business culture sellers and asked them what they did regarding the safety of their cultures they sell. The answers I got back were quite impolite to anthropological, but none had any idea of the safety of their culture, its purity, or cleanliness. From the perspective of the FDA and the Food Code, culture manufacturers MUST be “inspected” or the culture would not be usable as an ingredient. So, culture safety starts with: “Is the culture supplier an inspected facility?” If not, stop, move on. Ebay or other home seller marketplaces are not typically a place to find food safety. The next question is “how does the manufacturer know the culture is “clean” or better “safe”? As a Master Brewer, I can tell you that the moment a brewing yeast culture is contaminated, the beer will not be exactly as planned. It could end up a total loss. Larger culture companies understand the economics at hand and go to great lengths to ensure their cultures are clean, pure, and safe. Most will provide a certificate of analysis including microbiological analyses. For example a pure brewing yeast culture should have no bacteria, no coliforms, and no Staphylococcus aureus when tested. Beer culture manufacturers will also ensure that there are no wild yeasts. The presence of a wild yeast could make a great beer taste like a band aid. Even the smallest culture manufacturer can send off some of their culture to a testing lab for basic microbial analysis. But do they? In the absence of lab data, the retail-foodservice operator could verify their culture fermentation by performing a test batch. This is highly recommended simply because some microorganisms could die off in culture. Acetobacter aceti is notorious for this. For fermentations that produce high levels of acid, the acid can select for the intended culture and help eliminate spoilage and any possible pathogens. At the same time as the acid level gets higher, more of the culture dies off. What about back-slopping? Back-slopping is the practice of using culture from a successful fermentation for the next fermentation. If the current fermentation was successful in producing acids and flavors, then it is likely that the culture is “mostly” pure and a good candidate for back-slopping. 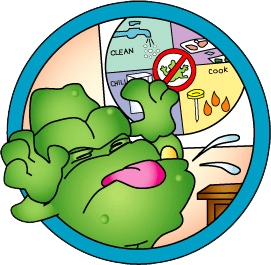 Back-slopping should be safe for a retail-foodservice operator fermenting foods using a HACCP plan, provided they provide an SOP describing where the original culture came from and how they determine the culture is maintained so that it is likely free of pathogens. Bottom line – buy cultures from FDA or regulatory inspected manufacturers. Ask for a certificate of microbial analysis. Create a starter batch of product from fresh purchased cultures to see that the culture produces the intended product characteristics. Use the “art” of fermentation to notice the nuances and slight differences that could mean the culture is not “clean and pure”. Lastly, use excellent sanitation principles to minimize cross contamination or environmental contamination of the fermentation process. Re-use these starter cultures for as long as they demonstrate successful fermentation characteristics indicating they are “clean” and “pure”. Large food fermentation culture companies: DSM, Danisco (including Kefir cultures), and Chr. Hansen.